2015 was my year to "Thrive". In some respects, I was successful, in others, not so much. But when I look back on the year as a whole, it was a good year. Not great, but good. 2015 was not the year I lost a lot of weight, to the contrary (and this is the really bad part), I steadily gained 14 pounds over the course of the year. But in terms of health - I worked with a chiropractor until insurance stopped paying the bills, I started a fitness class, and I went to physical therapy to deal with the radiating pain caused by ridiculously tight neck muscles. I attended all the necessary doctors appointments and testing. So I did address my health, just not in the way I originally intended. Thanks to Plan to Eat I have made weekly meal planning into a habit and streamlined grocery shopping as well. I LOVE this program and can't recommend it highly enough. Knowing at the beginning of each week what is for dinner each day has really simplified my life! 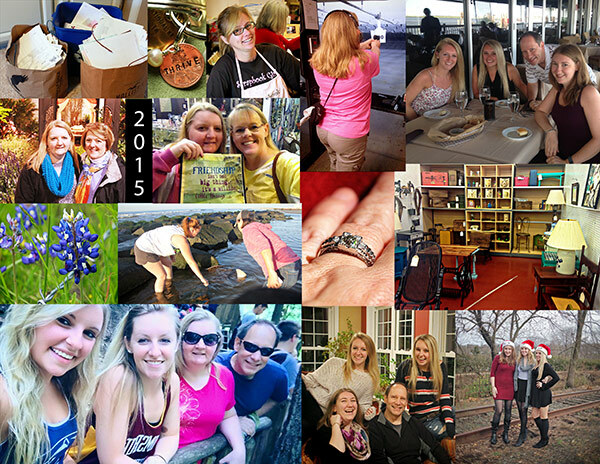 2015 was a great year for travel - Baltimore, Texas, Ocean City NJ, Kansas City MO - and for meeting up with Blog Friends - I met up with Karen and with Melissa (twice!). In 2015, I made some progress with decluttering (especially in terms of paperwork in the office!) but I have a long way to go! You'd never know to look around my home that we donated literally multiple van loads worth of stuff to Care & Share. But every space that gets tackled is a small victory and makes me feel lighter. I set a goal at the beginning of 2015 to read 12 books during the year. In fact, I managed to read 24 books! I also set a goal to try a new recipe each month. I think I was successful at least 10 out of 12 months. I definitely didn't "play every day" in 2015. In fact, play and art in general took a huge back seat to opening and running our booth at Black Rose Antiques and Collectibles. And the jury is still out on how long that will last. We renewed our lease through the end of March and are waiting to see how sales do in this first quarter. We had fairly brisk sales through the holiday shopping season, at least one retail theft that we know of, and other minor problems that make us question if we are in the right place. But we continue for now. All things considered, I'm happy to let 2015 go and ready to embrace 2016 with open arms. Stay tuned. It sounds like a pretty good year to me! Love the photo recap at the top of the post. I think you accomplished quite a lot in 2015. The decluttering alone would have been a real coup! Keep it up and 2016 is bound to be a banner year! Sending you warmest good wishes for 2016 - and marvelling at how much you did achieve in 2015. I often think our January goals are like plants - some bits wither away, other bits shoot ahead beyond expectation :). I think you achieved a lot in 2015 and I'm wishing you all the best for the new year ahead. I would say you did really well with THRIVE overall, exceeding some goals and making progress on others! I think you should give should be proud of all you have achieved in 2015. You did accomplish quite some things in 2015 - it sounds pretty good to me. We seem to focus on the things we did not do, but your review of your year shows how much you actually did. I feel with you on the weight gain - we're in the same boat here. But let's not give up hope! I found that decluttering is an ongoing process and is never truly finished. I think my year was a lot like yours - some ups and some downs. Hoping 2016 will be better, but not expecting it will be a lot different. Which is one reason my word for 2016 is brave.